Maria Diogenous is thrilled to serve as the President of DECA Ontario for the 2018-2019 year. Maria is a grade 12 student at Glenview Park Secondary School in Cambridge, where she is pursuing the International Baccalaureate diploma. Maria has been highly active in DECA for her entire high school career, competing at the regional, provincial and international levels as well as her position on the Provincial Executive Team as the Events Coordinator last year. 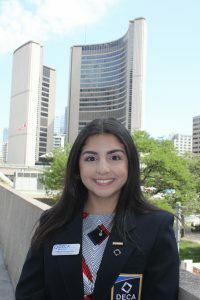 Alongside the Provincial Officers, Maria looks forward to extending her passion for business and is eager to help delegates reach their highest potential in DECA Ontario’s celebratory 40th year. Maria is highly involved in a variety of athletics within her school such as basketball, badminton and ultimate frisbee. She is also a competitive Karate athlete at Hourahine’s Martial Arts where she holds a variety of provincial titles, namely at the Ontario Summer Games. Aside from her personal athletic achievements, she is a dedicated coach for the Junior Competitive Development program where she inspires future provincial and national Karate athletes to strive for success. Maria is also a member of her school’s Student Activities Council, Mock Trial Team and served as the Training Development Liaison for her local DECA chapter. In her free time, Maria enjoys travelling, spending time outdoors and is a culinary aficionado who can often be found in the kitchen. Maria is determined to inspire every member on their personal DECA journey to have an unforgettable year. Maria loves to meet new people and strongly encourages members to use DECA as a networking opportunity. If you have any inquiries, ideas or recommendations, please don’t hesitate to contact her through her social media or email at maria@deca.ca.